This post will be blessedly short because I have family in town and I want to make sure they see all Amelia's skills and tricks. You just can't trust that they'll discover them on their own, you know. Basically, my feelings on this shredded pork could be summed up in two words - Make. This. Well, make this if you want an incredibly moist, tasty taco filling that requires little hands on time and is easily scaled up to feed a large crowd. And that has few dishes to clean up afterward. And that tastes amazing. And that tastes good in tacos, quesadillas, taquitos or whatever else you could want to do with it. Heat oven to 300 degrees. Place a large piece of foil over a baking sheet. Place pork shoulder on foil. In a small bowl, combine salt, pepper and ground cumin. Rub surface of pork shoulder evenly with salt mixture. Using a spoon (or your hands) cover pork shoulder with apricot jam. Pull up foil around pork shoulder and crimp to seal. Using a second large piece of foil, wrap pork shoulder again and crimp to seal. Return wrapped pork shoulder to baking sheet and transfer to the oven. Bake until tender, about 4 hours. (Longer if you use a larger piece of pork shoulder. I usually do about 6 hours for 4 pounds) Remove from oven and let cool slightly. Unwrap the pork, reserving any juices from the roasting, the onions and jalapeno rings in a medium bowl. Shred pork and place in a bowl. Pour juices, onion and jalapeno over the pork and toss to coat. 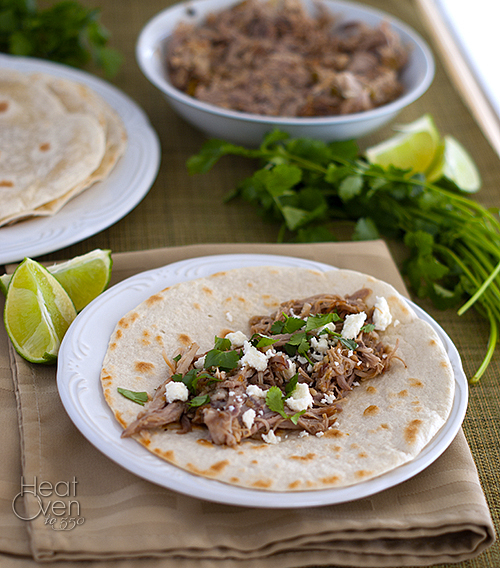 Serve pulled pork over warmed tortillas topped with cilantro and queso fresco. looks wonderful, as usual. I bet you could adapt to make in a crockpot. I love the idea of the apricot jam. These look delicious! Have a great visit with your family. Brandon came in the room as I was reading this post and immediately said he wanted these tacos for dinner! Adding this to my meal plan for next week. Can't wait to try it! Of all the times I've made pulled pork, I'm not sure we've ever used it in tacos. That just seems wrong, I'll need to try this recipe soon to remedy that matter! I love how easy this is, Nicole! The shredded pork looks so mouthwatering and delish all wrapped in a taco! I love your taco recipes. They all make me drool. I bought two pork loins that are slow-cooking in my crock pot today to be shredded into BBQ pulled pork sliders and now I am WISHING that I did this instead!